It is really important when we wear our babies in slings that they are safe. There are occasionally reports of babies suffocating in slings and nearly all these instances could have been avoided if safety guidelines had been followed. Many follow babies feeding in slings, being left to sleep in the cradle feeding position, or in carriers where they are not upright. Note, nursing in a sling can be done safely if done right. We are here to help you carry your baby safely and comfortably and there really is no substitute for hands on advice – please do bring your carrier to a meet for advice if you are unsure or come to us to discuss the right carrier for you. In the mean time, you might have heard of the TICKS guidance (below) which is perfect but can be hard to remember. An easier nemonic that directly relates to first aid guidance we all know is ABC. Airway – Keep babys nose and mouth visible with fresh air circulating around them at all times and their chin off their chest to keep the airway from collapsing – especially important in young babies. 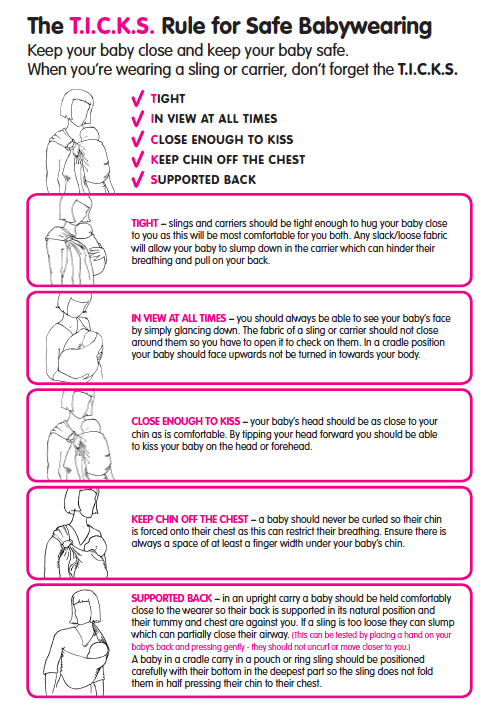 Body – Ensure the sling supports the baby appropriately for their stage of development – i.e. supporting the head and neck of younger babies and ideally in a ‘knees higher then bum’ position with the weight being borne by their bottom and thighs. Comfort – The carrier should be comfortable for you and your baby. Please contact us if you are not comfortable with your sling and we will try to help!